Integra streamlines supply chain, deploys Oracle EBS to centralize information and remove uncertainties. Integra‘s surgical kits are used in more than 500 critical, life-saving surgeries each week. Timely delivery of Integra’s kits is absolutely crucial. The kits are sent to sales reps, and after a doctor schedules a surgery, a sales rep delivers the kit to the hospital. The doctor uses the parts she needs and the kit is returned to the distribution center for replenishment. Tracking both the used and unused parts of each kit throughout every step of this process creates plenty of uncertainty. Gaea helped Integra identify and reduce supply chain uncertainties including missed orders and excess inventory. Gaea enabled Integra to make better decisions in order to reduce inventory and costs. Following Gaea’s EBS implementation, Integra was able to successfully reduce the number of shipments by 30% for certain sales reps and dealers. Fifteen systems were replaced with one, a 93% reduction, for an efficient, single source of truth and total visibility. For their FG labelling process, label templates previously totaling in excess of 10,000, were reduced to 20 for a 99.8% reduction in templates. Sales-rep order transmission between doctors and hospitals, and manufacturing and distribution centers, was accelerated. Missing inventory and number of shipments were each reduced by 10%. 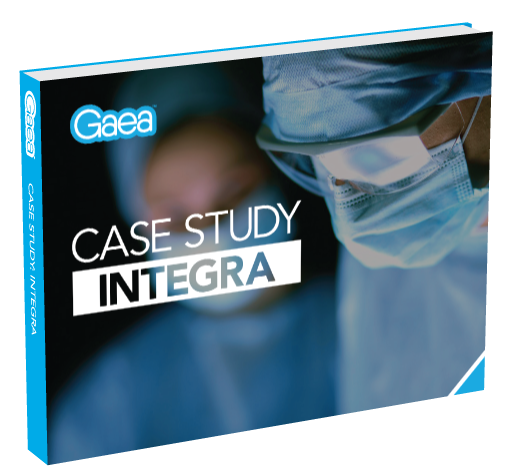 To learn how Gaea helped Integra achieve this ROI, download the full case study.